You are in: Home \ UKSA's #SeaChangeStories Blog \ Where's Jaime? Sailing the Eastern Mediterranean on a 54m classic motor yacht is the lifestyle currently being enjoyed by Superyacht Cadet Jaime Guerreiro. 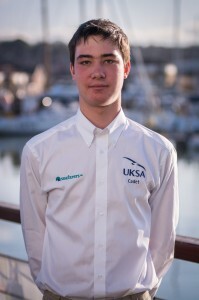 He graduated from the first phase of the Cadetship in March and spent a happy three months at Pendennis Shipyard in Falmouth working on the yacht, which was originally built in 1937 and has had a complete rebuild. The boat has a lot of history and is very traditional in the way that it operates, which Jaime has found fascinating. As part of his cadetship, Jaime will do an FdSc foundation degree in Operational Yacht Science at Falmouth Marine School. He had a lot of his course funded though Seafarers and the Milo Hanlon Bursary.